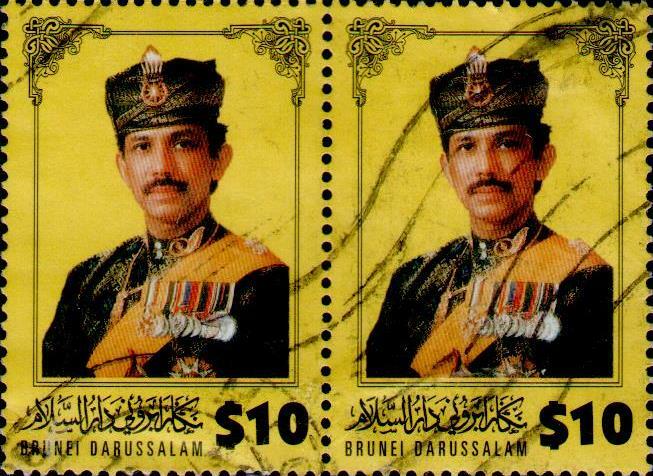 This is probably the most wanted of all Brunei stamps. Valued at five digit, not many can be found and many are fakes. I bought this a few weeks ago and it has just arrived. Honestly I am not even sure whether this is a fake or otherwise but judging by the price, it would not be an original. But if you do pay a lot higher how would you know it is not a fake? I have seen some of the authentication and I am not convinced either. So caveat emptor. Buy and pay at your own peril. Continuing on the Sarawak stamps. 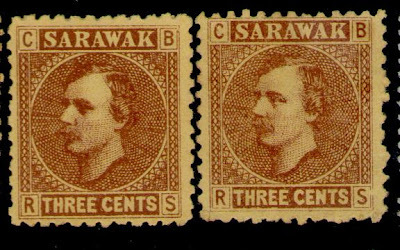 This set is the third series of stamps that Sarawak issued. 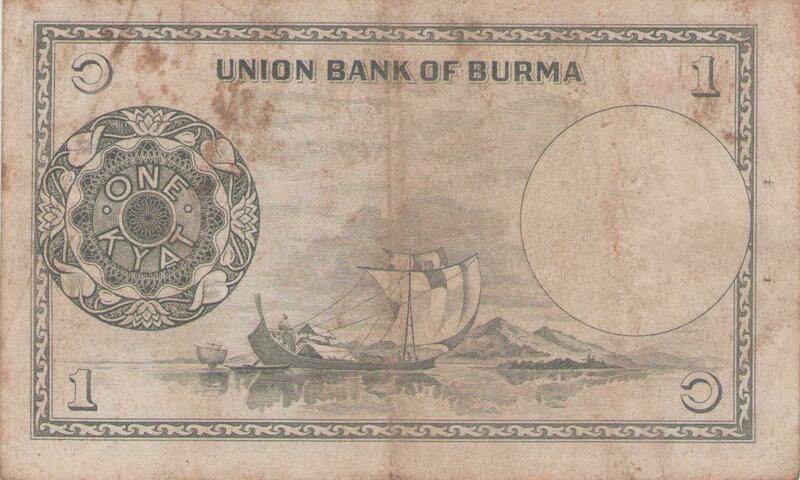 These were issued in 1875, a full 20 years before Brunei's first issuance in 1895. The first two series were single issues but this issue was multiple calues of 2c, 4c, 6c, 8c and 12c. 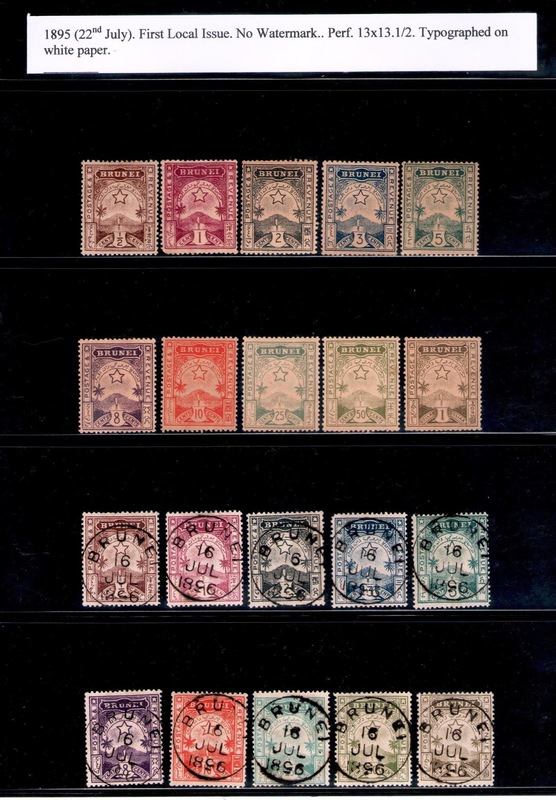 This set complements the second series of 3c which was issued four years earlier in 1871. According to some catalogues, the second series 3c were also overprinted 2c, so there were some need for smaller value stamps before this series was produced. 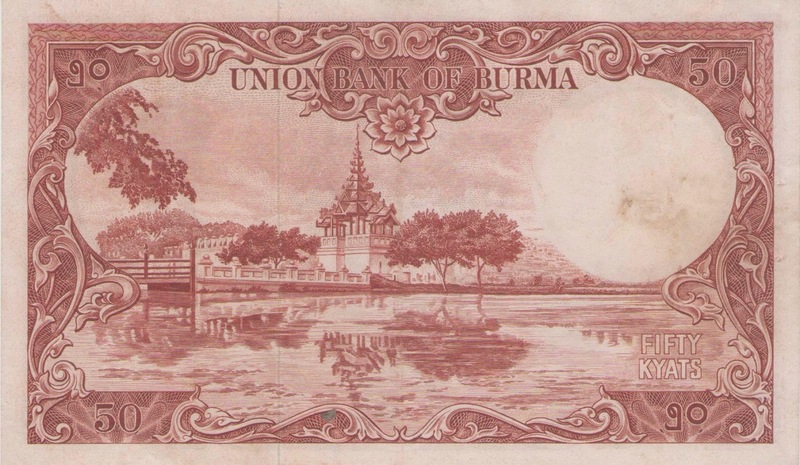 This series was in use for around 13 years before a fourth series was issued in 1888. I wanted to win this but I failed to realise the intense competition. This eventually sold for around GBP48. Historically and philately, if there is such a word, this a very important stamp and postmark. 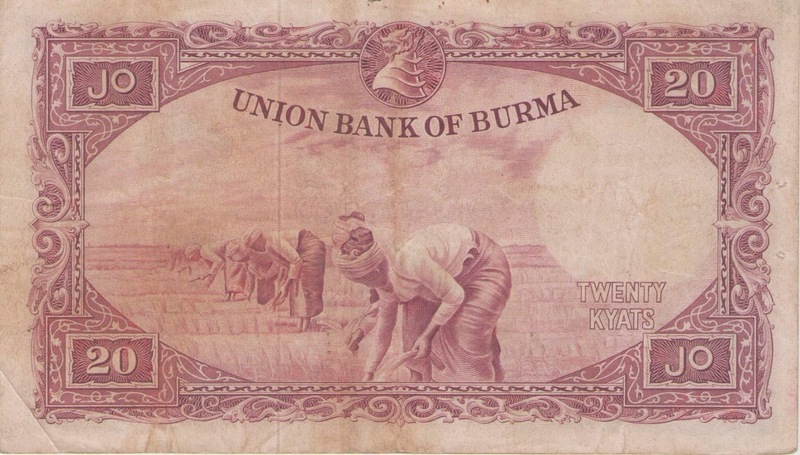 Muara up to 1921 was administered by the Brookes. 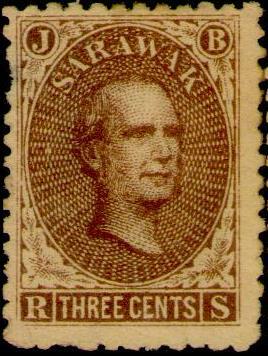 This include the postal service using stamps from Sarawak. 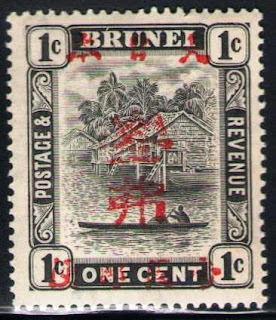 Sometime before 1921 the Brunei postal service started there. So this postmark showed that at least by 1914, Sarawak stamps were no longer in use in Muara. Continuing my story on my collection of Sarawak stamps, this is the second issue of Sarawak's stamps. This one was issued in 1871. Again the catalogue value for this is very low and is easily obtainable nowadays on the internet. So, if you want to start collecting Sarawak's stamps, it is not very difficult to start. A few years ago, one stamp seller who I had bought some items on the internet contacted me. Apparently he had to undergo a heart operation and needed the money and he wanted to sell his collection to someone who will be more than willing to take care of his collection as he says he is already too old. He offered them to me and I bought them, mostly Sarawak stamps. I had kept them aside and never really looked at them properly. 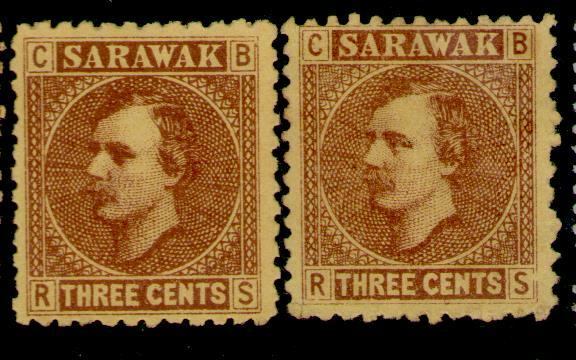 Recently I had a look and among the stamps were early Sarawak stamps including this first ever Sarawak stamp issued in 1869. The catalogue value is about $100 for a mint and about $500 for a used one. I spent the long weekend taking off used stamps from envelopes the usual wet water technique. I have a lot of used stamps collected from all the envelopes from purchases I have made from ebay throughout the years and also from other envelopes which my wife had collected when she was still with the government. I found these two stamps valued at $10 each. These stamps are part of the 1996 definitive series issued in October 1996. I checked against the catalogue and was pleasantly surprised that these stamps despite being used is still valued at $10 a piece. It is worthwhile also now to look for used stamps as their values will appreciate over time. 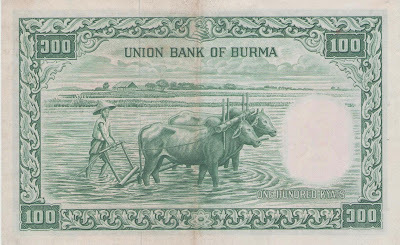 This Myanmar currency note series was the first and only one issued by The People's Bank of Burma in 1965. There are only four notes of the series. 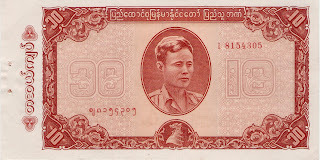 The 1 Kyat, the 5 Kyat, the 10 Kyat and the 20 Kyat. The previous issue was demonetized. 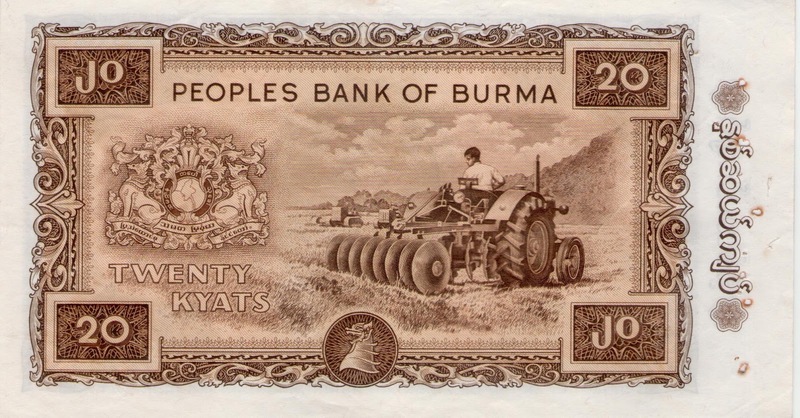 The obverse or front of this 20 Kyat note is the famous General Aung Sang while the back has a portrait of a Burmese farmer on a cultivating tractor. This note was not available in Vientianne. I had to go hunt on ebay for it. 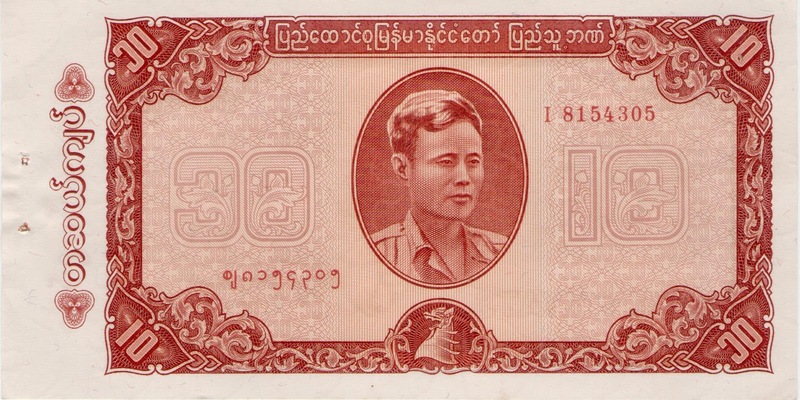 The obverse or front of this 10 Kyat note is the famous General Aung Sang while the back has a portrait of a Burmese woman picking cotton. 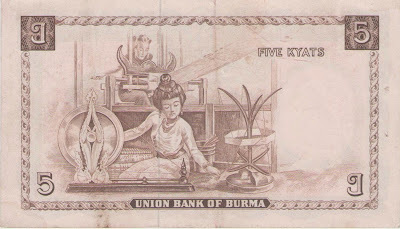 The obverse or front of this 5 Kyat note is the famous General Aung Sang while the back has a portrait of a Burmese farmer and a cow. 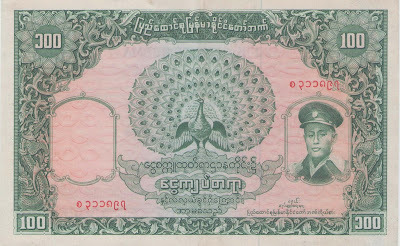 This Myanmar currency note series was the first and only one issued by The People's Bank of Burma in 1965. There are only four notes of the series. The 1 Kyat, the 5 Kyat, the 10 Kyat and the 20 Kyat. The previous issue was demonetized. 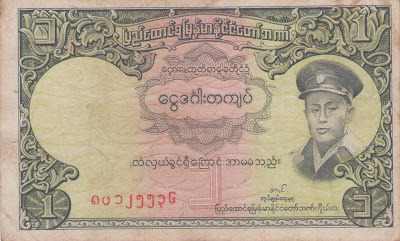 The obverse or front of this 1 Kyat note is the famous General Aung Sang while the back has a portrait of a fisherman at Inle Lake. 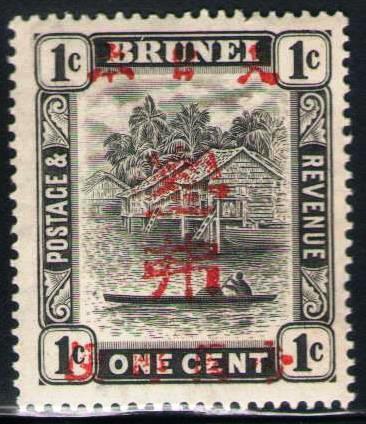 These 1895 Brunei stamps were the first to be issued in Brunei. The mint ones are about about a third of the value of the used ones. In Steven Tan's catalogue 28th edition (2011), the used ones are valued at $1,800.00. In Brunei you can get the used sets for around $600 to $800. 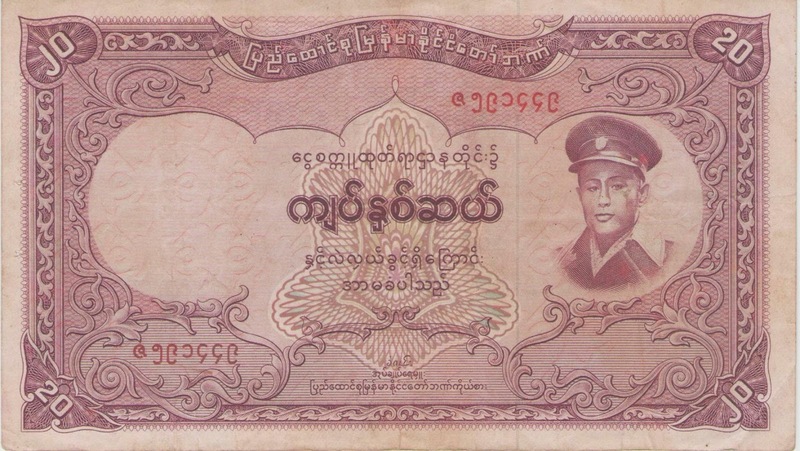 These are the lowest values of the 1958 Myanmar Kyats. 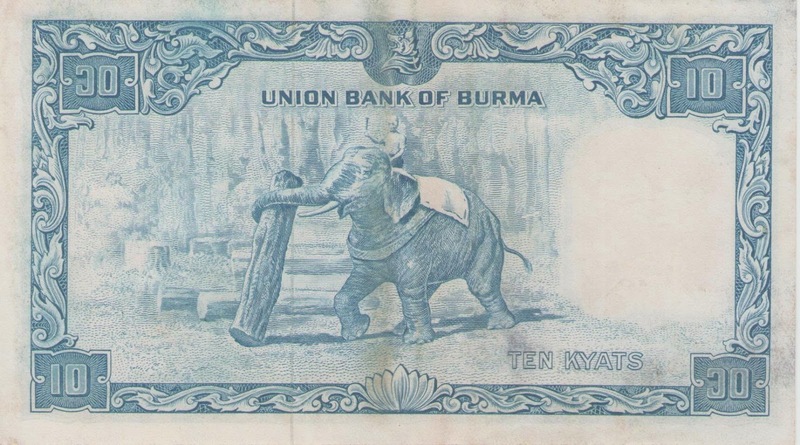 This 10 Kyat issued by the Union Bank of Burma in 1958 was quite popular as it had the elephant at the reverse of the note. Last Thursday I attended a nikah ceremony at As-sallehin Mosque. My wife's cousin's daughter was betrothed to her chosen love one. As usual part of the ceremony was a 'mas kahwin' where the groom has to pay to the bride a sum of money. In Brunei, that sum is usually around $200 to $300. I know of one state in Malaysia, Johor, which makes it a mandatory $22.50. Lately many have been following the practise of old where the sum is a gold dinar coin. I was told that the value of this gold dinar coin was around $300. After the ceremony, I decided to ask around and posted the question on my fb. I got all the answers. 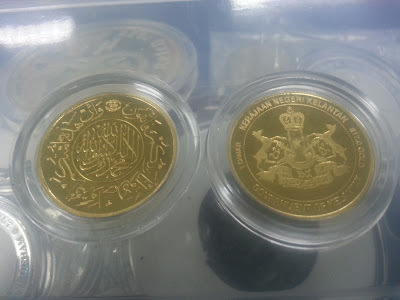 Apparently there are several companies selling the dinar gold coins around the region. This one in particular was actually sold by a company which had branches in all over the Muslim world including Brunei. Dealers called this the Brunei Gold Dinar. 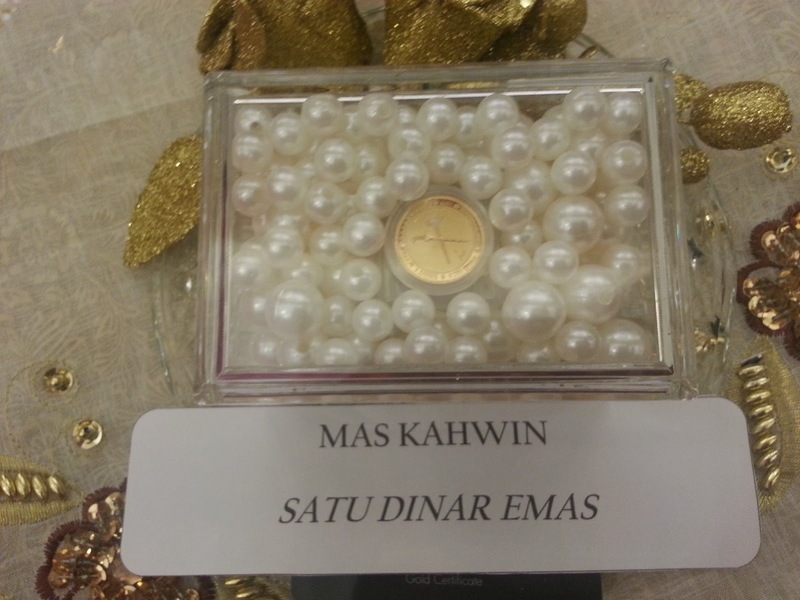 This dinar is made up of 999 purity of gold. Currently it cost about $330 or thereabouts. Another company is Malaysian based but their dinar gold coin was slightly impure which is 916 around 22 karat. The price of that gold dinar varies according to the market. Since the pricing was listed, it was easy to see. When I first looked, the price was M$591, today it was M$570. These gold dinars all weigh 4.25 grams. They weigh the same but their thickness and sizes vary slightly. 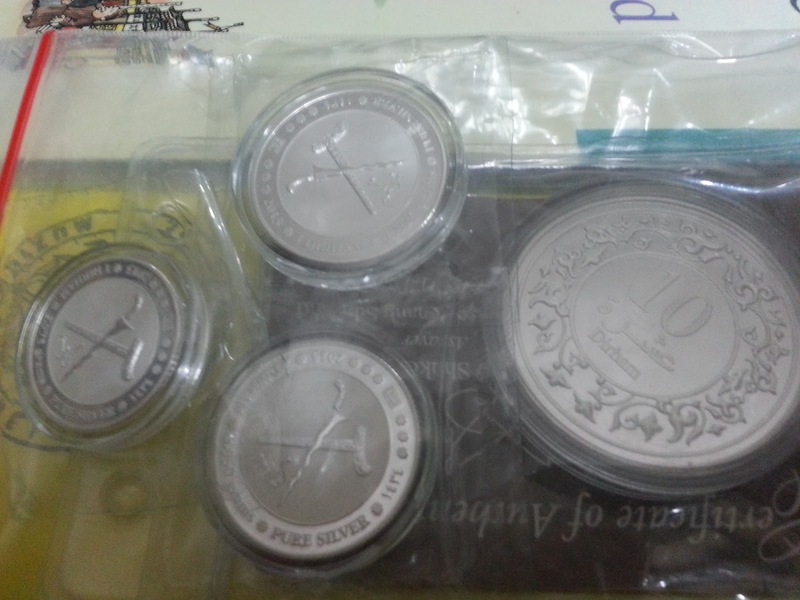 Another version is the silver dirhams which are very cheap at around $6+ for 1 silver dirham. They come in 1 silver dirham, 2 silver dirham, 3 silver dirham and 10 silver dirham. The gold ones also have various values similar to the silver dirhams. These are indeed interesting times for coin collectors to be able to collect something valuable and perhaps can be used as investment tools. 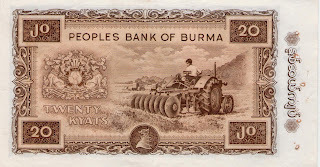 This is a close up of the obverse and reverse of Myanmar's 1958 20 Kyat note. 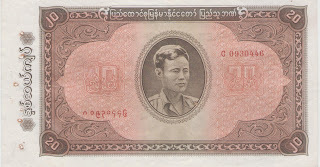 This 50 kyat note together with the 20 kyat notes were introduced in August 1958. 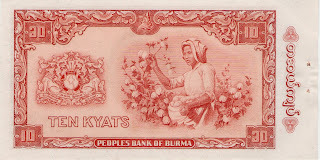 The 1, 5, 10 and 100 kyat were issued earlier in the same year. 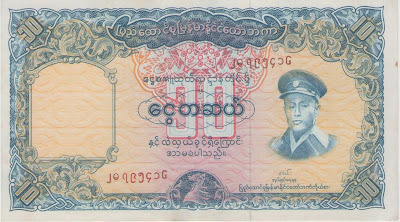 This 50 kyat together with the 100 kyat was demonetized in May 1964. I received this note today together with a number of other notes that I bought. This is my fifth or sixth note and I still enjoy buying them. There is nothing really striking about this note except that it is the first ten dollar note which did not have either the King or Queen of England. Instead it had a buffalo and hence it is better known as the duit kerabau. Kerabau meaning buffalo. In the reverse, Brunei's crest is shown. The crest is obviously a complete one as by 1959 Brunei already had its written constitution already mandated by then and so was the crest. The note was signed by Tun Tan Siew Sen. The interesting about this note was sometime in November 1967, the note lost value. 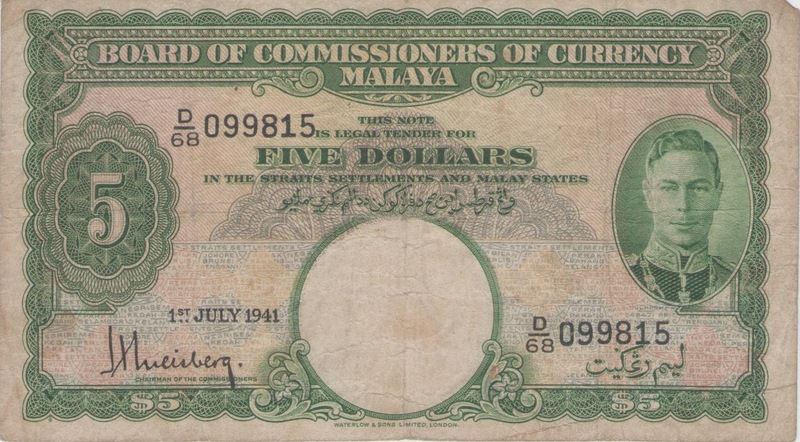 Originally it was convertible to the new currency notes issued by all the three countries Malaysia, Singapore and Brunei. But this note was linked to the British pound and in November 1967, the British pound was devalued. The value of this note was by then around $8.75 or thereabouts. Nobody wanted to keep it. Everybody ran to the bank to exchange it. Now the note is worth around $300 and above. So much for an unwanted note. 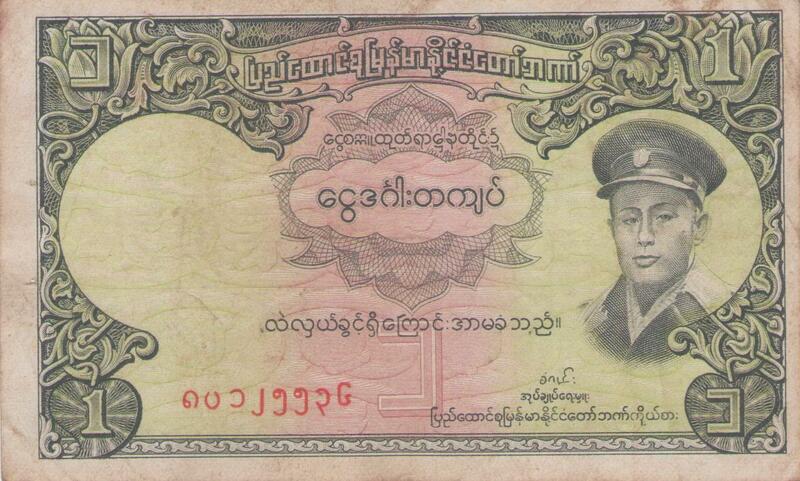 This is a close up of the obverse and reverse of Myanmar's 1958 50 Kyat note. This 50 kyat note together with the 20 kyat notes were introduced in August 1958. 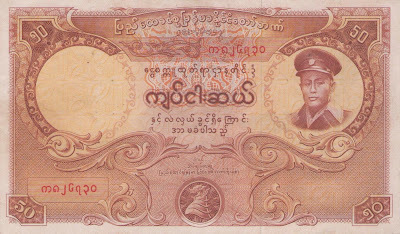 The 1, 5, 10 and 100 kyat were issued earlier in the same year. This 50 kyat together with the 100 kyat was demonetized in May 1964. 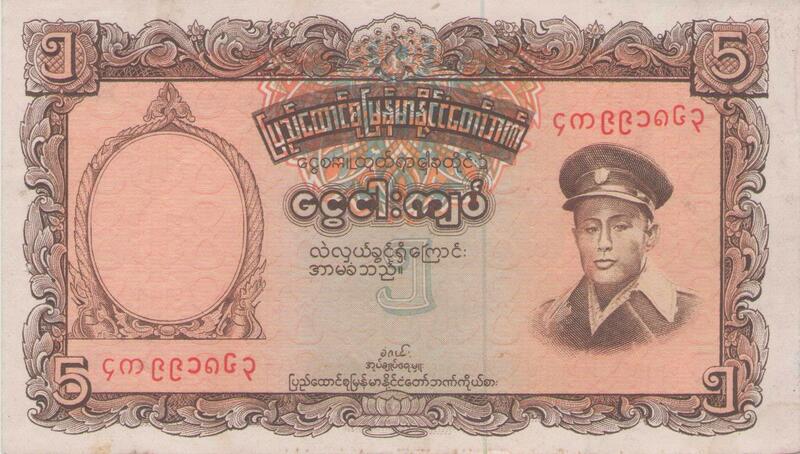 This is a close up of the obverse and reverse of Myanmar's 100 Kyat note. 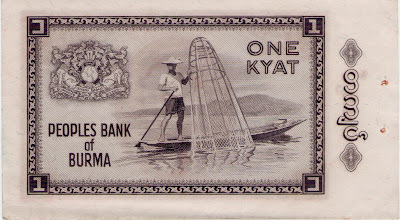 Wikipedia described this note as the third kyat series. The first kyat was coins only and the second kyat series was immediately after the second world war. The second kyat was issued by the Currency Board under the Union Bank of Burma in 1952. Those notes are quite rare. In 1958, the Union Bank of Burma introduced these third kyat series. 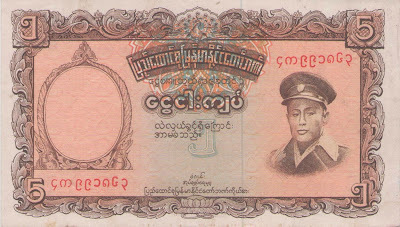 This 100 kyat was issued with the 1, 5 and 10 kyat notes. 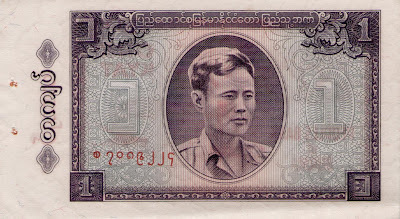 The major difference to this series and the seond series is the introduction of General Aunh in the obverse of the notes. 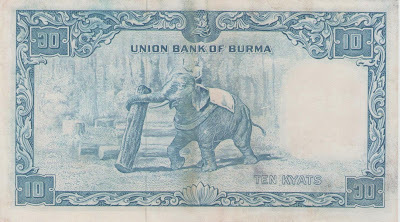 On February 12, 1958, the Union Bank of Burma introduced the first kyat notes, in denominations of 1, 5, 10 and 100 kyats. 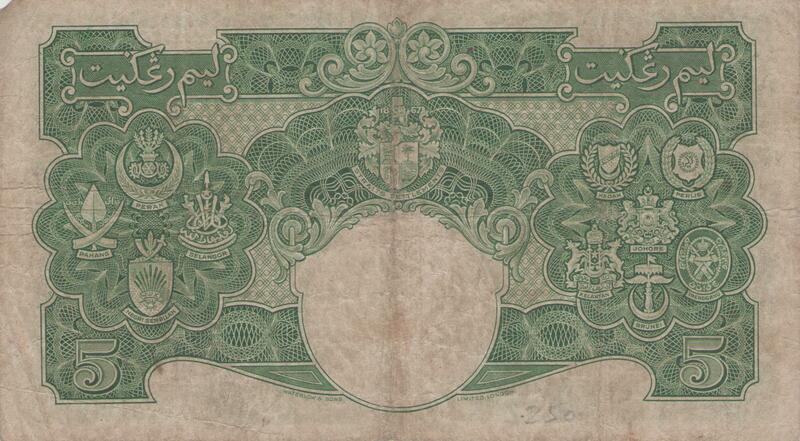 These were very similar in design to the last series of rupee notes, issued earlier. Later on August 21, 1958, 20 and 50 kyats notes were introduced. 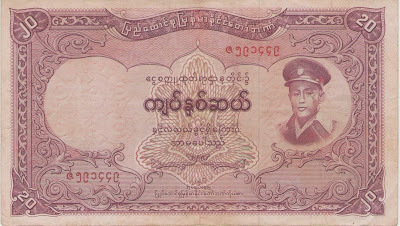 The 50 and 100 kyat notes were demonetized on May 15, 1964. This was the first of several demonetizations, ostensibly carried out with the aim of fighting black marketeering. I saw this note on eBay the other day. 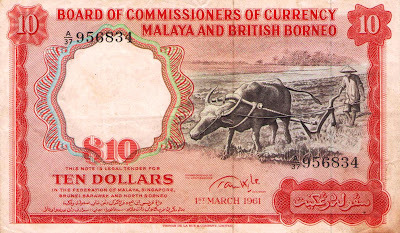 It has indeed been a while since I owned a few pieces of this note. I was not exactly on the market for it. However it had a nice price and it was quite close to the end of the bidding. It had this very tiny tear at the top right hand corner and so the corner was not square. I guess that's why nobody really wanted it. My final bid was around USD$69.99 for this note. I have not been checking on the catalogue for the price of this note lately. But I thought USD$70.00 was a nice price. I bought this a few years ago from a dealer in Singapore. I can't remember what possessed me to buy it but I am glad I did. I didn't realise the uniqueness until after I came back to Brunei. 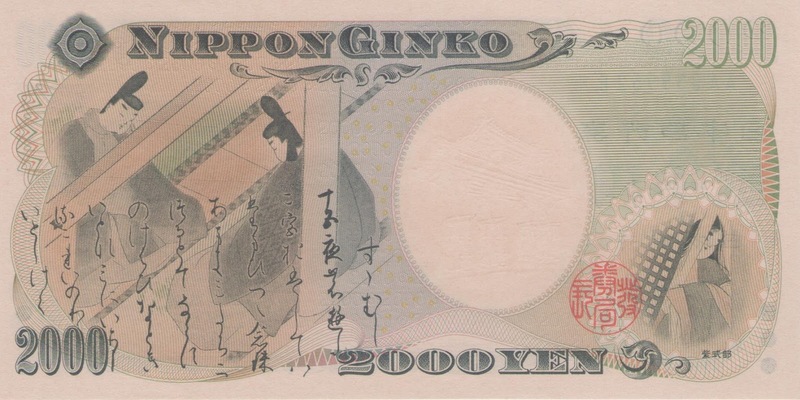 This is the only 2000 Yen note that the Japanese Monetary authority has ever produced. The 2000 yen note (二千円紙幣 Nisen-en shihei) was issued July 19, 2000, to commemorate the 26th G8 Summit and the millennium. 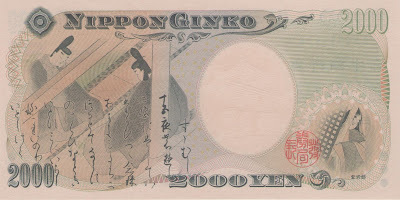 Known as the D Series, it was the only 2,000 yen note design ever to be printed. 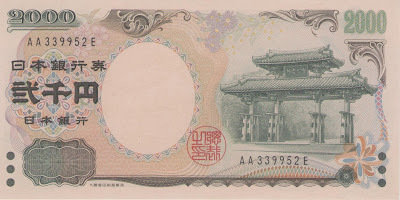 The design was similar of that of the other Japanese notes in circulation at the time of issue. The obverse has a serial number and shows Shureimon, a 16th-century gate at Shuri Castle in Naha in Okinawa Prefecture. The back shows a scene from a famous Japanese literary work called The Tale of Genji and a portrait of Murasaki Shikibu, the writer of the classic literature. This Chinese 10 Yuan was part of the second series of the Renmimbi. 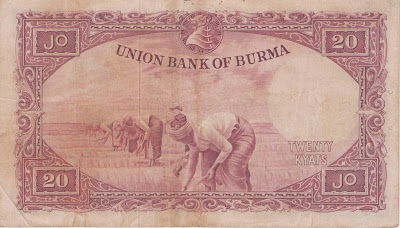 It was issued in 1955. I am not very familiar with the Chinese currencies but I remembered when I was in Nanjing in 2008, this particular 10 Yuan note was the most elusive. I even found a shop which sold the complete set of the Chinese Renmimbi except this particular note was not in that box. The shop assistants told me that this note was not easy to get. When I came back, I searched for it and eventually found this one. This one came as if it h as not been used. I am not sure whether this is genuine as most photographs I have seen of this note showed used notes. The only thing I can tell is that this one has a watermark which is visible when you hold the note to the light. Does that prove it is genuine? This Brunei $100 Hassanal Bolkiah B Series is probably one of the harder notes to find. 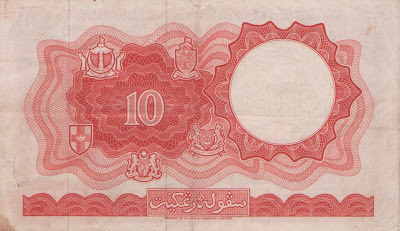 The B Series came out in mid 1980s to replace the Hassanal Bolkiah A Series which came out in 1972. However the higher value notes were prone to sophisticated counterfeiting. In fact when I was the Deputy at Tabung Amanah Pekerja in the early 1990s, I recalled during those early days we had not yet placed a currency violet light checker yet. One of the notes were received was actually a counterfeit. It was soon after that every single counter were fitted with the currency detector. This particular used note (graded probably EF or XF) was sold to me at $130 by a local dealer. Since this is one of those those harder to find notes but at that price, it is not that bad. However on the internet especially on ebay the price would be much higher. I have never been to Azerbaijan. The closest I have been probably is when I was in Russia and when I was in Iran. Then sometime last February I was informed that there will be a meeting on Intercultural in Azerbaijan and I was secretly hoping that I could go but it clashed with another meeting which I had to attend in Tehran. However our Deputy Minister went to represent Brunei Darussalam and I asked her to keep all the Azerbaijan's money and exchanged with me. When she came back, she gave me the set and those six are currently the currency notes used in Azerbaijan. The back of the notes are standard - Azerbaijan's map. So only the front depicted the various cultural aspect of the country. The notes are all of different sizes from 1 Manat being the smallest and the 100 Manat being the largest. 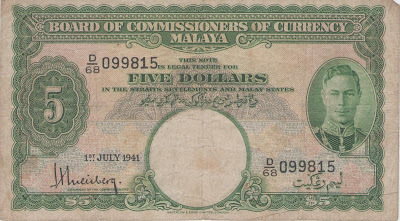 The value of the Manat is also very high. 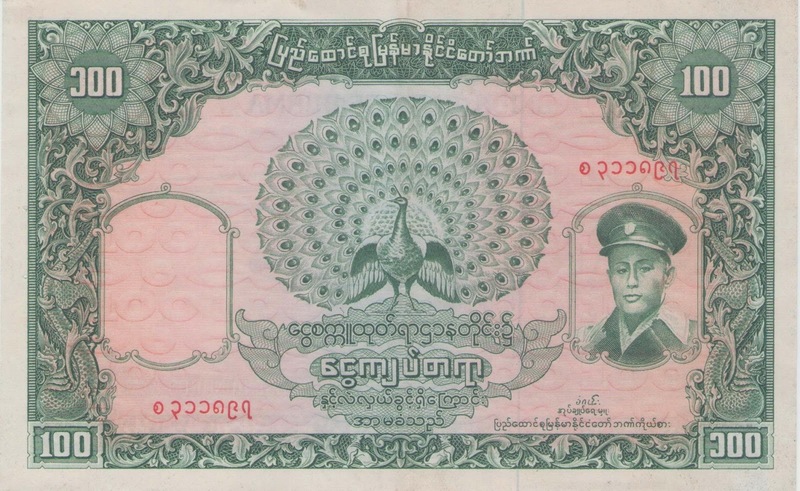 This 186 Manat notes cost me B$299. 1. To read more blog entries, just click on the banner at the top of the page. 2. To know more about how you can participate with other fellow stamp collectors in Brunei at the Brunei Philatelic Club, click on the club's label below. Fellow collectors meet every month. This is a blog site for me to share one of my interests. This one talks about currency notes and stamps of Brunei (of course!) and from other countries around the world.